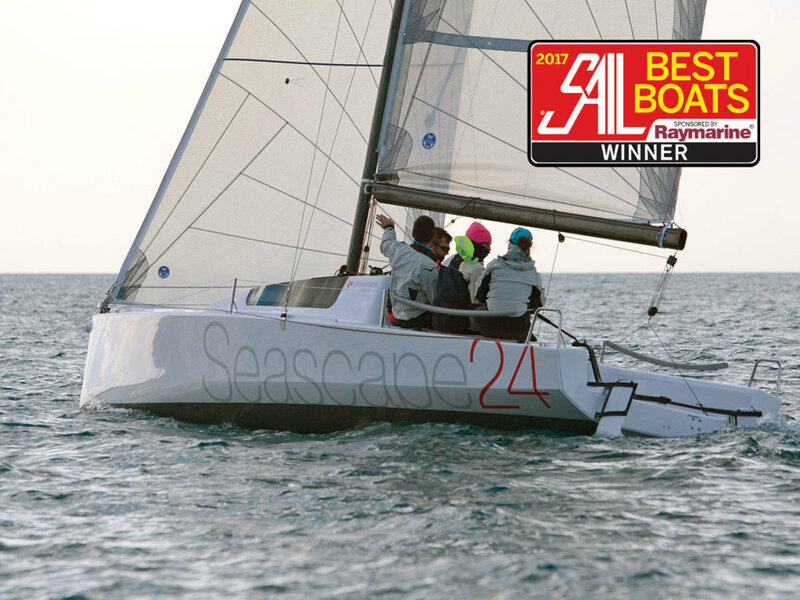 This was a decision that provoked some debate among our judges, as the Seascape 24, which boasts a long retractable carbon-fiber bowsprit and a modern go-fast hull form, is obviously designed primarily as a performance boat. However, it is also a simple and affordable boat, easy to rig and easy to sail, and the builder has been careful to provide enough accommodation to attract trailer-sailer cruisers who like to have fun sailing fast. Down below you’ll find enough berth space—a decent-sized double V-berth and two settee berths with slide-out extensions—to comfortably sleep four adults (or two adults and a pair of kids). There’s also plenty of space to stash away a small chemical toilet, a cooler and a camp stove, while an optional electrical system gives you interior lights and a small distribution panel. Aside from its trailerability and ease of rigging (with its backstay-free rig and lightweight carbon-fiber mast the boat can be rigged and launched in as little as 30 minutes) the Seascape 24 has the added advantage of being fully beachable. The twin rudders, for example, are simply daggerboards set in cassettes and are fully retractable, while the heavily ballasted swing keel, which carries 36 percent of the boat’s total weight, is easily hoisted all the way up into the hull with a simple-to-operate worm gear. Similarly, the hull laminate is reinforced with a stiffer, denser foam core, so that the Seascape 24 can take the ground without sacrificing itself structurally.